ANNAPOLIS, MD (May 01, 2017) – Incised fumewort (Corydalis incisa), also known as purple keman, is a biennial, shade-tolerant forb in the poppy family, related to bleeding-hearts and to the showy garden perennial spring fumewort. It is native to eastern Asia. Incised fumewort appears to be uncommon in the horticultural trade, but may spread in soils with shipments of other plants, or be sold as seeds and bulbs for medicinal uses. It was first reported as naturalized in North America when it was collected along the Bronx River in New York in 2005. Widely distributed but still uncommon in the mid-Atlantic, this is an early detection species that may still be eradicated by a region-wide rapid response. 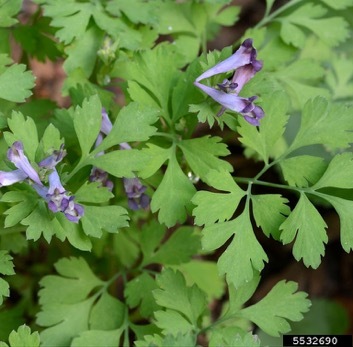 Because it can be found blooming now, the Maryland Invasive Species Council has named Corydalis incisa the May Invader of the Month. Incised fumewort is a 3"-24" biennial forb with deeply cut, glabrous leaves, and purple flowers. The first year plant shows few leaves, which grow from a small tuber. The second year plant is upright with numerous branched leaves. Leaves are divided into three leaflets, with those leaflets further divided into threes, or even divided again into threes. They are 1.5"-5" inches long and wide, on 2"-8" leaf stalks, with the smallest leaves near the inflorescence. The purple flowers (rarely white) are tubular, about 1/2" long with reduced, irregularly cleft sepals. The petals touch each other but are not fused. Flowers occur in elongated clusters up to 4" long, with 10-16 flowers per raceme. 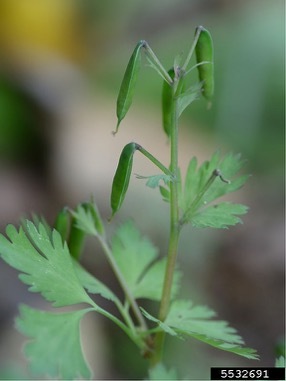 Green oblong seed capsules hang from the ends of the flower stalks; they are less than 1" long and look like tiny, short green beans. Incised fumewort has seed capsules that open explosively when the seeds are mature, and can launch the small black seeds up to 10 feet. In the mid-Atlantic C. incisa will flower and fruit from May to June. Corydalis incisa is the only native or naturalized Corydalis species with purple flowers in the northeastern USA. The foliage of the native yellow fumewort (C. flavula) is similar, but as its name suggests, C. flavula has yellow flowers. When not flowering, the two species may be distinguished by the color of their stems: C. incisa stems are reddish at the base; C. flavula stems are green. C. incisa is native to China, Korea, and Japan. It has been reported in both the botanical trade and medicinal plant trade. Recent naturalized populations have been found in the NY Botanic Gardens, Bronx Park, and along the Bronx River in Westchester County, in Virginia in Fairfax, Albemarle, and Madison Counties, and in Nashville, Tennessee. It is reported from gardens in Maryland and the District of Columbia. This species grows in well-drained soils and in floodplains. It is typically found in floodplains and along small streams in soils and habitats where another invader, lesser celandine (Ficaria verna) thrives. It can grow very densely in monotypic stands along riverbanks. Land managers who find this species have generally used mechanical removal methods. Populations take several seasons to eradicate, possibly due to a persistent seed bank or remaining root and tuber fragments. Seasonal follow-ups to managed populations are recommended. Mechanical removal should be performed before seed capsules form to prevent dispersal of seed, since touching the swollen pods can send seeds springing away from the parent plant. There is currently no information on the effectiveness of herbicides on this species, and no biological controls currently exist for this species. Although widespread in isolated populations, little is known about this species' ecological impacts. If it can occupy and thrive in the same habitat as lesser celandine, its potential range and impact is enormous. Coupled with its mode of seed dispersal, and the possibility of dispersal by movement of the first-year tuber, this species may spread far, if not rapidly, within Maryland. C. incisaseems to persist where it is well-established, but populations may not spread unless through significant disturbance. Atha, D, J.A. Schuler, and S. Lumban Tobing. 2014. Corydalis incisa (Fumariaceae) in Bronx and Westchester counties, New York. Phytoneuron 2014-96: 1-6. Lamont, E., S.D. Glenn, and S.M. Young. 2011. Noteworthy plants reported from the Torrey Range — 2009 and 2010. J. Torrey Bot. Soc. 138: 472-484.